i've had an epiphany, an a-ha moment, a "duh stupid" realization after my mini-breakdown that started last week. the fact that it started last week should have been a big CLUE about what was really going on with me. the fact that i didn't make the connection just proves to me how powerful our emotions are and how we are NOT driving this crazy emotion train. we are simply passengers and control is an illusion. sure after the fact when we are no longer acting irrational and batsh*t crazy, we can make a better plan of attack for next time but in the moment, no chance. i'll get to why i think this is important to my efforts to get healthy in a minute. first i want to talk about what made me regress to my 3-year-old, the-sky-is-falling self. i had a conversation with my brother last tuesday. it wasn't an argument or even a disagreement. it was just a conversation. you know those things grown-ups have. he's been helping me out with some things temporarily in my life and told me he isn't going to help me anymore. there was no reason and nothing led up to it. it's just time for that help to end. this gave me anxiety and made me panic because of the short notice but that was not what threw me into a mini-depression. you see, it brought up all these emotions from growing up. emotions i've dealt with through counseling, forgiveness and maturity. but i wasn't being rational. i felt abandoned and even betrayed. i just started thinking about how my dad wasn't there for me and my sister growing up financially or emotionally and how unfair it was and how pissed that makes me. how my brothers (who are from my dad's second marriage) got everything. life was easy for them compared to me, my sister and my mom. i was thinking about how it felt to grow up and feel abandoned and unloved and how to this day my step-mother resents us in my father's life (that B!). i have a great relationship with my brother and my father has apologized more than once for his behavior. he has great remorse and has spent the past 20 years trying to make it up to us. i don't really feel any bitterness towards him. but none of this mattered!!! not one bit. all that fear and those negative emotions just came up. i didn't even realize i was having all those irrational thoughts until today when i started talking to my friend and it just all came out in gulping sobs. so crazy. i feel so much better now but i'm shocked i wasn't aware of my internal dialogue. i think this is about 75% percent of the problem with where i am physically and why i'm fat. it's all those underlying, subconscious emotions. there is not a whole lot of talk about THAT part of losing weight. i think spark does a decent job of focusing on the whole person but very few trainers or health buffs i met ever talk about this. but i mean how can we not address our emotional and spiritual health along this journey? i don't think our physical health can be divorced from our emotional and spiritual well being. i knew this on some level before today but now i really understand it. i'm determined to work on that side of myself while losing weight. it can't ever be ignored. not just so you can feel good about yourself and be motivated to stick with your program but because our emotions can literally undo every single physical thing we accomplish. *sigh. the work is never done. just when i thought i had reached the pinnacle of self-awareness, i realized i know nothing! so much to learn about myself. life truly is a continuous journey of self discovery. i kind of like that though. fun. Dealing with the internal stuff is something I struggle with too. It's what sends me off the rails when I know better. Wise words. So much of it is ALL about the underlying emotions - I too am trying hard to have the courage to identify and face my feelings head on. You are a courageous woman! Great blog! You definitely have got me thinking...I need to do some digging and soul searching also. Our past experiences definitely leave lasting scars to overcome. I have been learning some of that lately myself. Hugs to you on this journey! What an awesome blog! You are SO right. There are so emotions we need to deal with during this journey!! 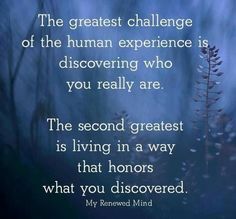 I am so happy for you that you've been able to uncover some of those! Focusing only on the outer body at the expense of the you within is like washing and waxing your car daily but never changing the oil. You are correct - the journey should be about your entire well being, inside and out.